I had planned on staying over on Bowen until Monday but I got a call from work (starts Tuesday), informing me of the need for black pants. I have black EMT (paramedic) pants, and black tuxedo pants. No good. So I decided to come home early and go shopping Sunday and/or Monday for pants and black shoes to accompany them. I had a nice 3 day stay on Bowen. I did very little. I read a bit of my European Union textbooks, went rowing five times, and hung out with my Granny and Uncle David. 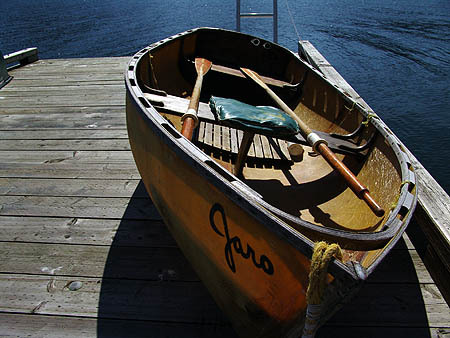 The rowboat is a bit over 40 years old now – my mom used to row it when she was young! It’s called Jaro (all boats have names), which comes from James + Rosemary, my uncle and mom, the two youngest in their family. 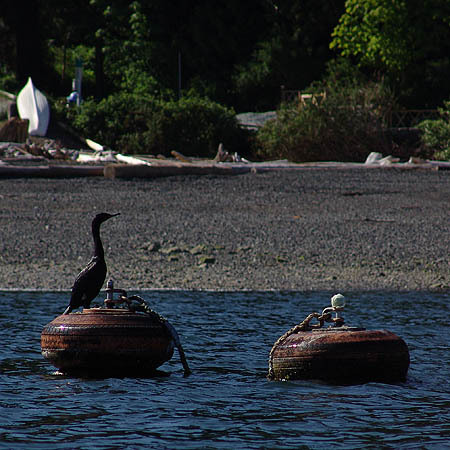 While out rowing, I spotted this bird (I think it’s a shag, but I’m no ornithologist) sitting happily on a buoy. 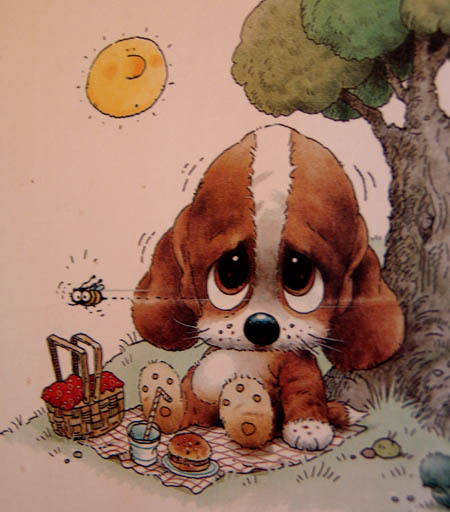 Then it became less happy and left! There was a fierce storm, the worst in decades, several weeks ago. 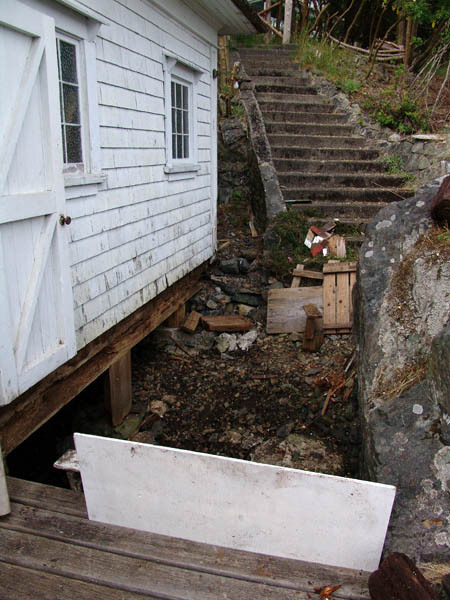 It did a lot of damage, including ripping the ramp of our neighbour’s float off. 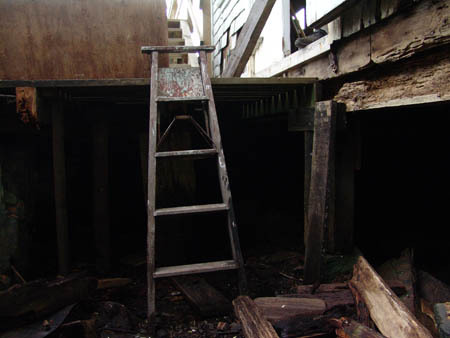 It also destroyed part of the wooden floor outside our boathouse. This has never happened in the 48 years my Granny has had the place. 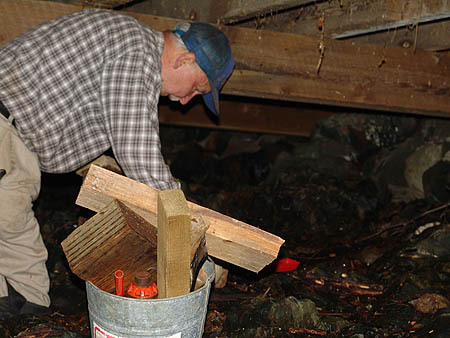 Uncle David, Mr Fix-It, has been working hard to fix supports under the boathouse which were washed away – they hold up the boathouse, so they’re very important. Today I went rowing in the morning for about half an hour. 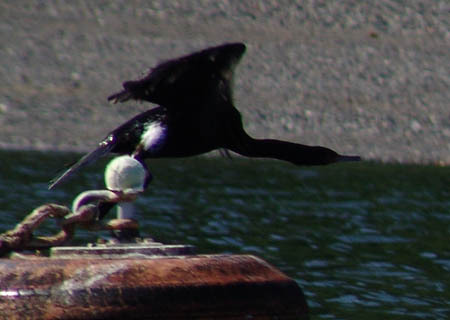 I was going to go rowing again at about 1pm when the sun came out and it was super windy. After 5 minutes on the water I decided it was too rough and that, if the waves got much higher, it would be too difficult to bring the boat back in without help. As it was, it took me about 5 minutes to get the boat in after several failed attempts, when it normally takes all of 30 seconds. The ferry and bus rides home were pretty smooth and uneventful, the way I like them. Took me a total of 2 hrs 20 mins to get from the cabin to my house in Vancouver. Not bad. 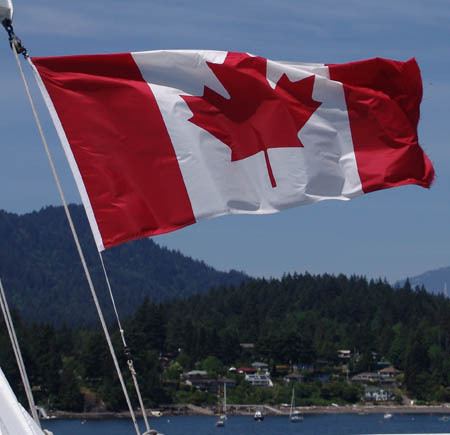 This entry was posted in Canada, North America, Travel and tagged Bowen Island, Granny, Rowing. mmmmmmmmm reese’s peanut butter cups. i actually did find one store in edinburgh and one shop in kilkenny that sold ’em – for aboot 60p or 80c (granted, 80’s about the going rate for chocolate snackies in ireland). they have a ‘reese’s nutrageous bar’ here too, it’s like a mr big bar but with peanut buttery filling in the middle. it ain’t no peanut butter cup, however. will request some of the parents, in any case. One of your pic write-ups reminds me of our long lost conversation piece– ornothology. “I’m an ornothologist” “As an ornothologist, I believe it’s a bird” etc etc. How did we talk for so long about one word? I mean, it is a pretty sweet word, and kind of ambivalent, but did it really deserve as much reflection as we gave it? I think our hikes might have been a bit too long. I remember that we talked about that for some time, but I can’t remember where we were at the time… Australia? Thailand maybe? 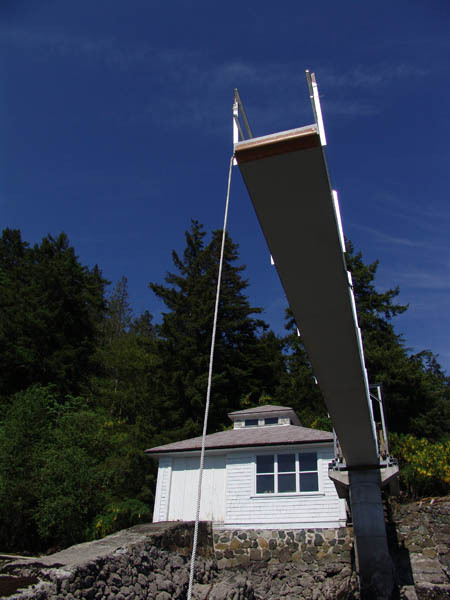 I’m glad you had a nice time to “reflect” out on Bowen Island. 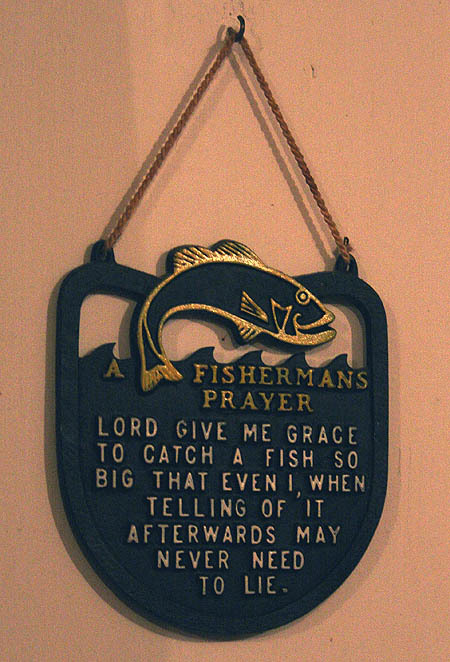 That Fisherman’s Prayer is priceless! Hahahaha!